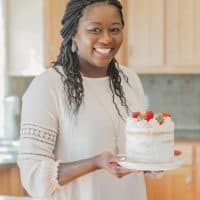 Thank you to The Folger Coffee Company for sponsoring this pumpkin spice latte coffee cake recipe. All thoughts and opinions are my own. How is it mid-October already?? The season is flying by too fast. So many things on my fall bucket list that I have yet to cross off. All I’ve done so far is apple picking, shop for new boots, some burgundy pieces and lots of apple recipes. Pumpkin is next on my list and I can’t wait to go on our annual fall festival at the pumpkin patch too. These classic fall moments are always great family moments. 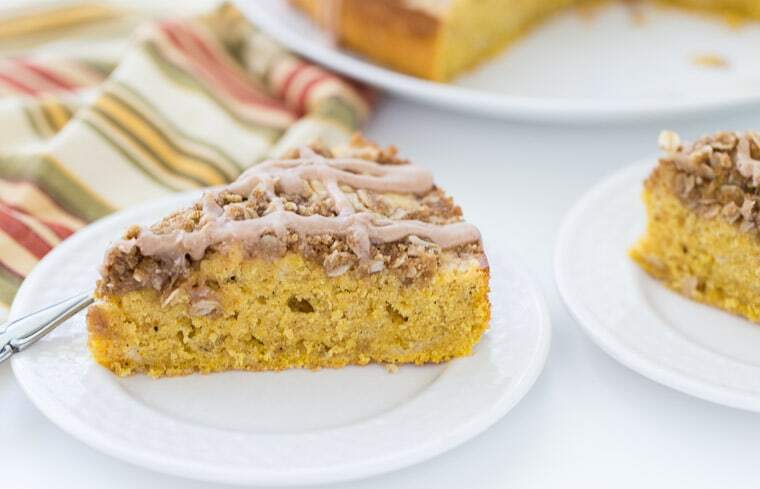 To enjoy more of Fall’s pumpkin, I put the coffee in coffee cake with this pumpkin spice latte coffee cake with the help of Folgers® Coffee Classic roast. I don’t understand why coffee cakes have no coffee in them. They are perfect with a cup of coffee yet we don’t add that great flavor to it. Since we all love our #PSL in the fall, I figured I should add some coffee to this pumpkin spice latte coffee cake. For that, I simply infused the buttermilk with Folgers® Coffee classic roast for a few minutes to enable the grounds to steep into the buttermilk. The result is a ridiculously moist, crumbly and full of warm spices of the season, a good dose of coffee and earthy pumpkin flavor. It is perfect for a fall brunch accompanied with a great cup of coffee. 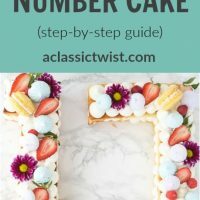 Sometimes you just need a classic cake for those comforting times in the year and this is how I feel about coffee cake. It is simple, filling and perfect for a cozy fall or winter evening. 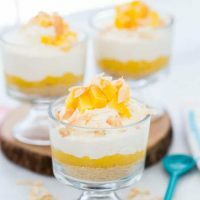 We always enjoy a cup of Folgers® coffee at the end of family meals and why I was excited to partner with them in creating this recipe. 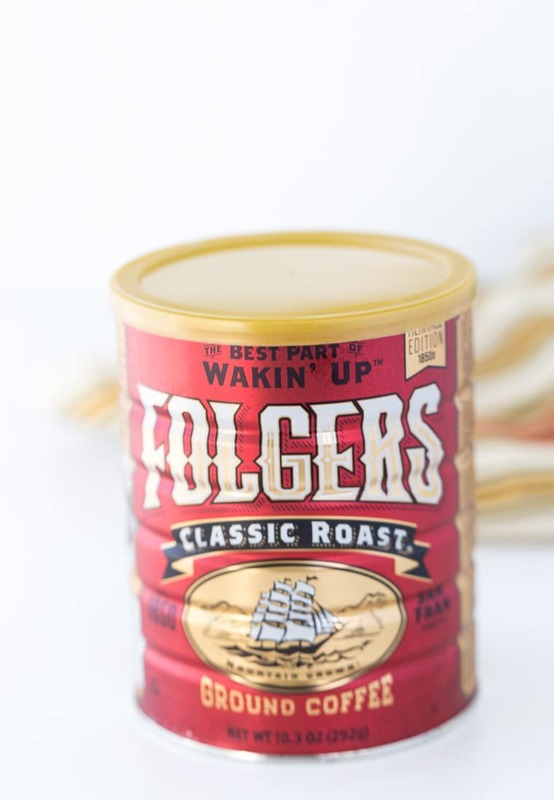 Folger’s is celebrating family traditions from early morning wake-up calls, to family celebrations with this new Folgers® Limited Edition Collector’s Can. Traditions, family moments and familiar tastes pairing perfectly with a good cup of coffee. 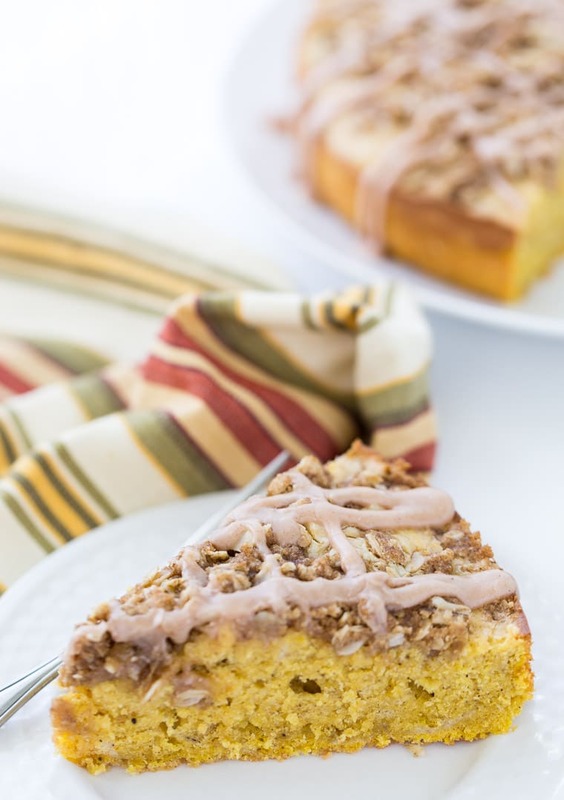 And a cozy slice of this pumpkin spice latte coffee cake if I may! 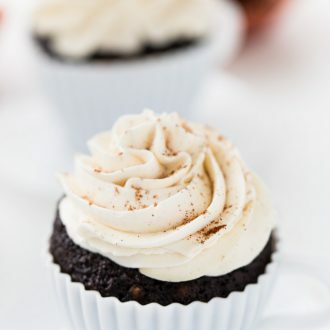 I know you will love it and get your PSL fix as you celebrate Fall with your family. Preheat oven to 350 degrees F. Grease and line a 9-inch springform pan with baking spray. For the filling, In a small bowl, whisk together the egg and coffee. In a separate bowl, beat the cream cheese and sugar with a mixer on medium speed until fluffy. Add in the flour, vanilla extract and cinnamon. Mix until blend. Add in the egg mixture and mix until combined. Transfer cream cheese filling to a small bowl and set aside. 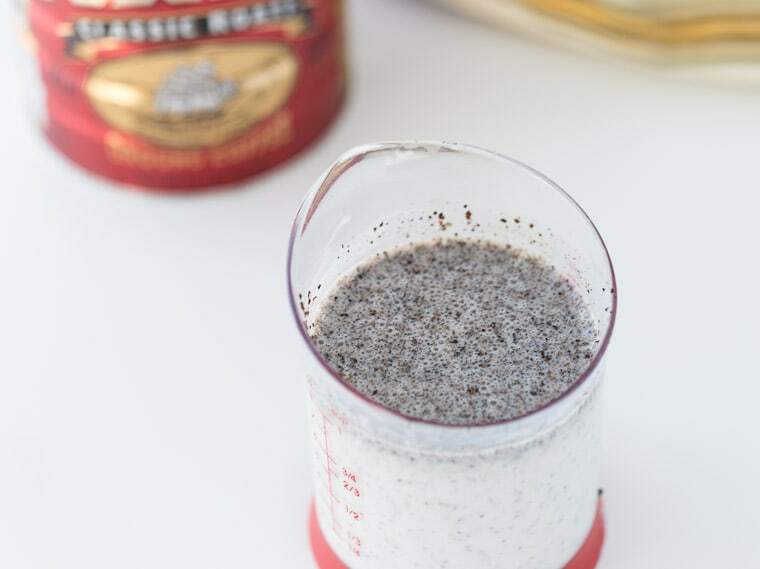 In a measuring cup, whisk the buttermilk and coffee grounds together. Let sit until ready to use. In a medium bowl, whisk together the flour, baking powder, cinnamon, nutmeg, baking soda, salt, cloves and all spice. In another bowl, beat the butter and sugar together until light and fluffy, about 2 minutes. Add in the eggs, one at a time and mix until combined after each addition. Beat in the pumpkin. 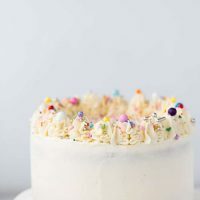 Alternatively add the flour and the buttermilk mixture, beginning and ending with the flour and beating after each addition until well combined. Transfer half of the batter to the prepared springform pan. 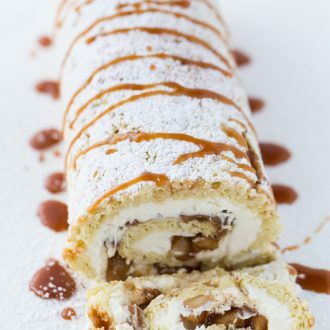 Using a tablespoon, dollop half of the cream cheese filling ontop of the batter. Spoon the remaining batter over the filling. Finally, finish with dollops of the rest of the cream cheese filling on top. Using a butter knife, swirl the cream cheese filling to create a marble. To make the crumb topping, combine the brown sugar, oats, flour and butter in a small bowl. Mix until crumbly. Sprinkle the crumb topping over the pan. 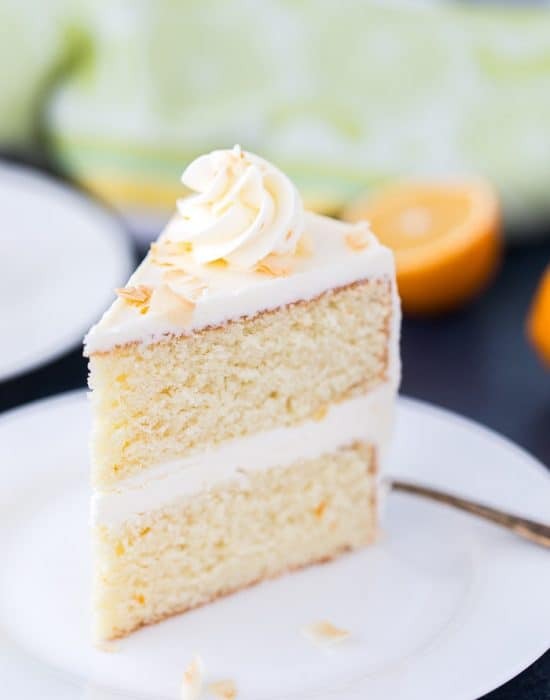 Bake for 45-50 minutes or until a toothpick inserted in the middle of the cake comes out clean. Let cool in the pan on a wire rack for 30-45 minutes. 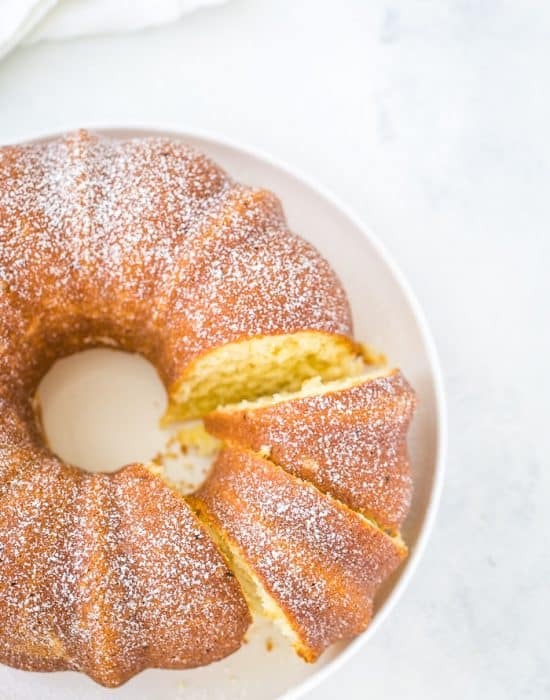 Whisk together the powdered sugar, cinnamon and milk to form a spreadable glaze. Drizzle the glaze over the cake before serving. To get Folgers® Limited Edition Collector’s Can, head to your local Target for an exclusive offer in Cartwheel. It is available for a limited time exclusively at Target so grab one soon. 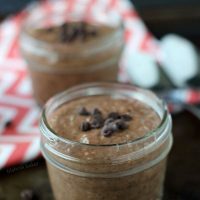 This looks so delicious and perfect for the cold weather months! 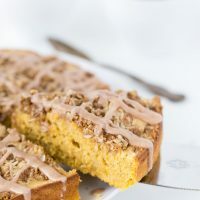 PSL coffee cake?! This looks AMAZING, Zainab! I love the flavor and the gorgeous presentation of this dish. Wishing I had a slice (or five) for breakfast this morning! Right?? I am a PSL lover!! 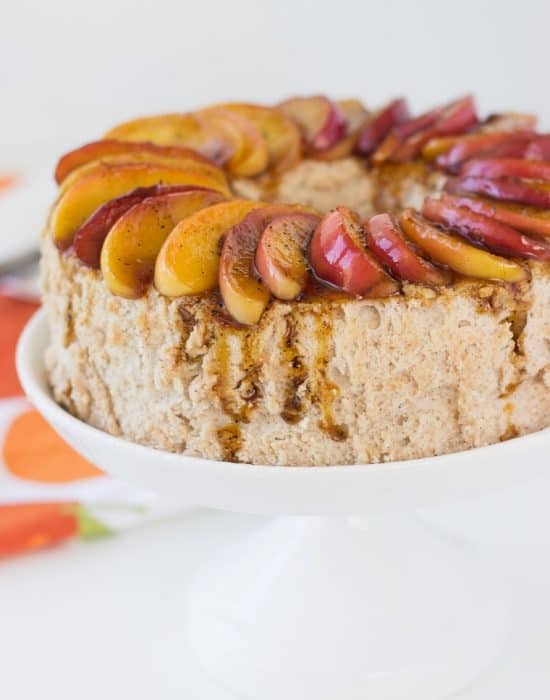 This is my kind of coffee cake–you know, the kind with real coffee in it! And autumnnn, pumpkin yes! Hahha thats is the best kind of cake!! Well you have officially done more to celebrate fall than I have! I have yet to buy anything! lol. I’ve gotta get on that huh? And I absolutely need to get on this cake! This looks amazing, girlfriend! Such a great use of pumpkin spice latte!! I mean forget the drink, who wants that when they can have this coffee cake?!? Genius, girl! Cheers! 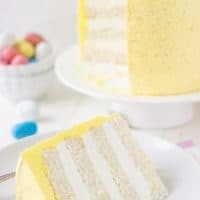 This looks so incredibly moist with that cream cheese layer. I love coffee flavored treats! Your fall sounds a lot like mine — I just bought a bunch of burgundy pieces and I just ordered some new boots! I clearly need some coffee cake now. Lol! Yay!! I am loving that rich fall tone 🙂 And boots are just the best!! Looks Delish! So are the coffee grounds in the cake, or do you mean instant coffee? Hi Lala, I actually used the coffee grounds in the buttermilk to infuse the coffee. You can strain the grounds out if you choose to but I didn’t and you couldn’t even tell the grounds were in there. 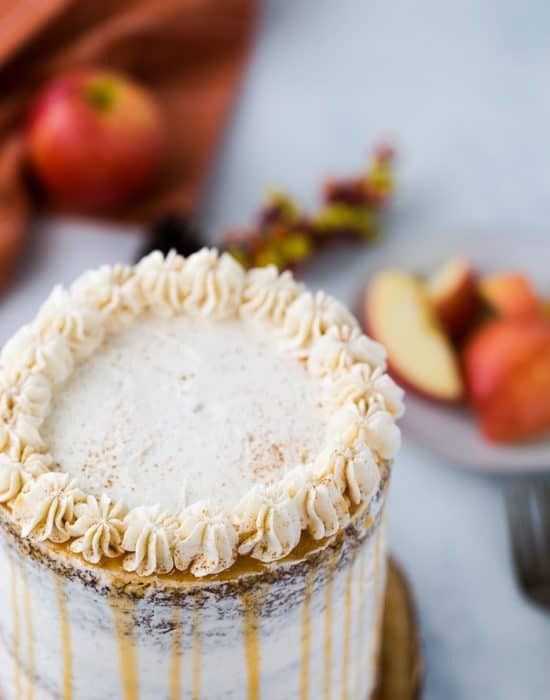 PSL Coffee cake? Now that’s my kind of PSL. And look how beautiful it is! 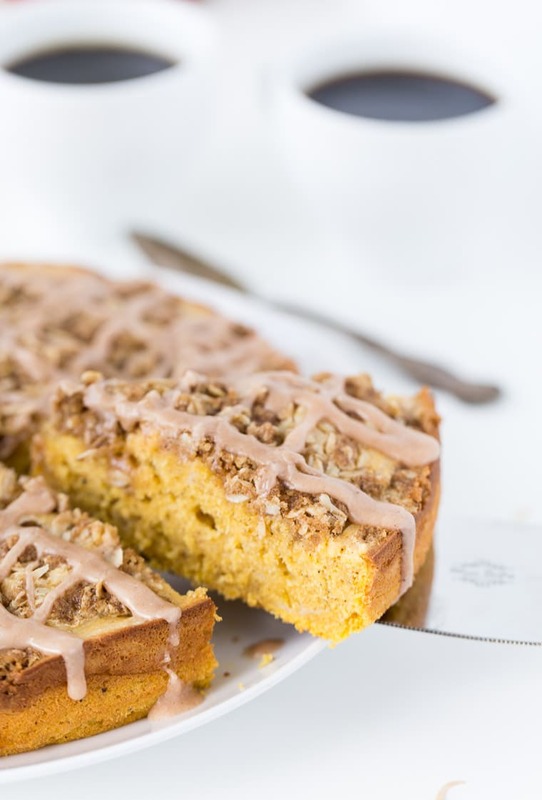 YUP, you definitely win with this pumpkin spice latte coffee cake Z! I would LOVE to go to a pumpkin patch!! We are going to the pumpkin patch this week. Wish you could join it!